Take CAMP's ultralight race axe, the Corsa, sprinkle in some high-tech reinforcements, and you get the Corsa Nanotech. Sandvik Nanoflex® is a steel alloy that is 60-70% stronger than steel, allowing CAMP to dramatically increase the durability of the pick and spike without significantly increasing the overall weight. Also added is a single curve in the shaft which provides better clearance when picking, while not interfering with walking or plunging performance. The Corsa Nanotech is perfect for light and fast tours where you may encounter steep icy snow or might need to self arrest. 7075-T6 aluminum alloy gives the shaft strength while keeping the overall weight to 250 grams (8.8 ounces) [50cm]. Sandvik Nanoflex steel pick and spike add strength in the key wear spots, making it suitable for everyday use. 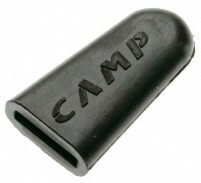 Can be used as a T anchor for belaying, cutting cornices, or rescuing someone from a crevasse. Nylon plug in the spike keeps ice, snow, and dirt out of the shaft so you don't lug it around unknowingly. CC4U wear indicator lets you know if you manage to wear out the durable pick. Grip pad is located near the spike to prevent the axe from slipping up or down. Optional head and spike protectors protect people and things from sharp ends. Optional sliding leash has a rubber stopper for basic hand support while climbing. Materials 7075-T6 aluminum alloy with Nanoflex pick and spike. Notes All sizes have nylon plug to keep out snow. 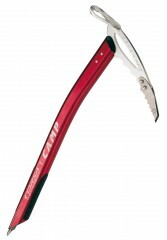 Bottom Line Ultralight yet durable mountaineering axe. I've used my Corsa Nanotech twice now, and I'm extremely happy with it. Ultralight, light enough to genuinely not notice it on your pack, and meaty enough to feel secure climbing steep, complex terrain. The pick is sharp, the plug keeps snow out of the spike, the shaft curvature is nice if you're gripping the axe just under the head climbing on "all fours" (say with a whippet in the other hand) as it gives you a small break from getting your hand wet. For the weight it's hard NOT to bring it if you think there's any chance it'll get used. I got the axe quite late this year but am looking forward to putting it to a full season's work this coming winter. And there's still snow out there now! I have now used this quite a bit, including holding it along with a ski pole in some absolutely-cannot-fall terrain. I've also had the dubious occasion to genuinely self-arrest with it. Very happy, it has taken some abuse and still looks basically new. I pretty much never bring a whippet anymore, since this provides so much more functionality at little if any weight penalty. I have only taken this out a few times, but imagine it will be the only axe I ever take. On my pack, super lightweight. In my hand, feels great, and the added grip helps. It's a no brainer to strap onto the pack since it adds very little weight, and if you need it you will be glad you have it. 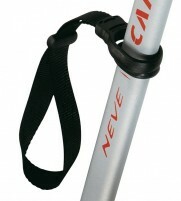 I purchased the 60cm, since I will sometimes use it as a "cane" to walk with on steep ascents. Overall- can't speak of the durability since I have only had it out a few times, but from other reviews above sounds like it will hold up for a long time. This axe has accompanied me on mountaineering routes, skiing objectives, and on any day when I wonder...should I bring an axe? For comparison, I've also spent a huge amount of time with traditional aluminum and steel axes, ice tools, and the regular camp corsa. I like this axe much better than the regular corsa. The weight is trivial. It's enough to bring on any trip and not worry about the weight. The steep tips are a big improvement over its green cousin. For one, they'll stick in ice without breaking. Further, the spike is a nice touch for firmer snow. The two biggest improvements over the greenie are a shaft plug to keep snow from accumulating inside the shaft, an the bend in the shaft, which gives better clearance or swinging into ice, and more frequently, allows for use of the high dagger position without you hands in the snow. The grip tape patch is actually an appreciable addition. It wears a little bit with time but really improves traction on the shaft for swinging. 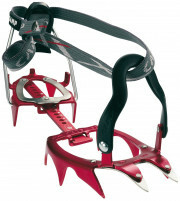 I have used this product on all my ice/snow mountaineering trips for the last 5 years. Most of the time it stays strapped to my pack and for that the weight savings over a traditional ice tool is obvious. Although it spends most of the time on my pack, I have used it for it's intended purpose several times. The curved shaft does help prevent knuckle bash when swinging over head, although the traditional shaped pick is not very conducive for that use, but it has helped me over the occasional ice bulge. In more traditional use it plunges fine and is comfortable to hold for long periods. Go with the 50cm length to save weight. Durability wise I have had no issues. Still sharp thanks to the steel, and light thanks to aluminum. I was very impressed with the performance, weight and feel of this axe for late season trip to the Tetons this past season. Effective and useful! The weight advantage made bringing it a no brainer for technical sections. Time will be the judge of durabilty and overall value but great so far. Overall: With an impressively effective pick and spike for an otherwise all-aluminum ultralight ice axe, the CAMP Corsa Nanotech ice axe definitely rates Five Stars, despite a couple unimportant oddities. Background on product familiarity: I have been using the 60cm length since 2008. I am not an ice climber or technical “alpinist” by any means, but I have used this piolet on very firm snow up to just over 50 degrees. First, the first impressions out of the box: The weight penalty relative to CAMP’s lightest Corsa ice axe is trivial, yet the pick and spike (which is nicely plugged) have sharp metal inserts. Maybe even too sharp – if you usually carry your unprotected spike protruding from the top of your pack perilously close to your head, then you might want to reconsider that arrangement! The first oddity is the sandpaper grip on the base of the ice. Sure, that would be a big advantage for swinging this like a technical ice tool, but the only time you might be doing that with this piolet is for chopping out a platform, and its relatively dull all-alu adze isn’t the best choice for that anyway. The big disadvantage of the sandpaper is that you could not use the axe to pad the lip of a crevasse for the rescue rope without risking sheath abrasion damage. Fortunately, the sandpaper is not sprayed on but instead is essentially a piece of tape that I easily removed. Second impressions, in use: I haven’t noticed the curvature of the shaft, whether for better or worse, even when swapping back and forth between the Corsa Nanotech and a predecessor (XLA 210) of the Corsa. What I have noticed is the effectiveness of the spike, especially when partially plunging the axe into very firm snow for a two-handed self-belay during some nervous moments. I have not had a chance (fortunately!) to test the effectiveness of the pick in any real self-arrest, but its enhanced penetration compared to an all-aluminum head is very obvious. Third impressions, for long-term durability: An ice axe should of course not be subject to typical durability concerns, but still, after lots of use, just a few superficial scratches on the shaft are the only signs of wear. What is 11 + 6?